Studded with classic songs, Gypsy carries audiences back to the days of vaudeville as Rose, a single-minded stage mother, seeks stardom for her daughters. A young Stephen Sondheim wrote the clever lyrics for Jule Styne's lush music. Arthur Laurents' book is based loosely on Gypsy Rose Lee's memoir of her mother's controlling force on her career. 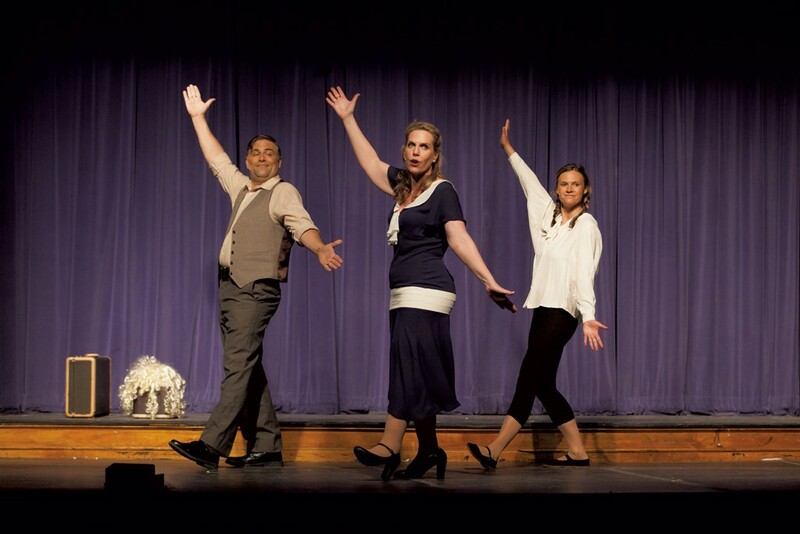 In Stowe Theatre Guild's production, the singing takes center stage. Structurally, the musical combines the pure entertainment of vaudeville and burlesque routines with a character study. Since its Broadway debut in 1959, Gypsy has been considered an exemplar of the "book musical" that weaves song and dance into a dramatic story. Gypsy Rose Lee would find fame as a striptease artist who captivated audiences with her stage persona; the musical shows the very beginning of that career. Her sister became the film star June Havoc. That makes Mama Rose two for two at launching careers. If "stage mother" has negative connotations, this story is about 100 percent effective American drive and hustle. Lee's memoir is the inspiration, but Laurents creates a mother far more charming than the real-life Rose. In the musical, Rose channels her own desire to be famous through her daughters, the talented, crowd-pleasing June and the reluctant Louise. Starting with preteen talent shows, Rose nudges the kids up each rung of the vaudeville ladder, nearing the top just as America loses its taste for such entertainment. When June leaves the act for Hollywood, Louise trudges on and into the world of burlesque, the surviving vestige of live performance. It's rock bottom, but with a huge upside, for Louise finds her true calling in striptease. Rose's cheerful, in-it-to-win-it songs are all about victory, and considering her success, she'd rank as a great CEO. As a parent? Let's just say no one's evaluating any trade-offs she makes. For that matter, the plot is such a jaunty business that the other kids she acquires to populate the vaudeville act appear as if by magic, not by kidnapping. Though June and Louise duly note that they're not receiving an education and eat a lot of cold Chinese food in dingy hotel rooms, the spirit is always upbeat. This production summons some of the glitz of variety shows, but the rapid scene changes don't allow for elaborate numbers with bold choreography. The biggest spectacle is a heartwarming one, as child actors perform two vaudeville routines — a little heavy on the marching in place but jolly nonetheless. Talula Leven, as young Louise, joins Barley Earle, Ryley Earle, Mateo Fernandez, Lily Weigand and Julia Wulff to surround Ellie Feinstein as the applause-hungry young June. Some of the kids are appearing onstage for the first time; all appear to find the joy in live performance. Abby Erwin plays the grown-up Louise with some nice nuances. Erwin's Louise shuffles along as the story's second banana, but when she has to bail out the family by filling in for a stripper, combing out her pigtails brings her to life. In a musical montage of stage appearances, Erwin shows her gradually acquiring formidable ease in the world of burlesque. She adds fine singing to the role, especially in a duet with June. As June, Shannon Brodie is an ever-dutiful daughter, springing to attention and plunging into a split to follow her mother's stage directions. As Herbie, the love interest Rose takes for granted, Scott Weigand is endearing. And he's a fine foil for Rose's big numbers, especially the haunting "Small World." As Rose, Jennifer Warwick doesn't manifest bad parenting so much as the power of positive thinking. She's so focused on tomorrow's success that today's disappointments don't register. Warwick makes Rose thoroughly likable, giving only one glimpse of pain when she learns that June has left to pursue stardom on her own. Warwick quietly fingers her daughter's goodbye note, briefly revealing a crack in her façade. Then she plasters it right over with the rousing "Everything's Coming Up Roses." Carrie Phillips, Britten Leigh and Holly Biracree play burlesque artists who welcome Louise into their world of bustiers, twirling spangles and feathered headdresses. Gypsy calls attention to the quiet tug of war between every performer and an audience. Entertainers like June take the stage and presume the audience's attention. But others have to prove themselves and imagine viewers sitting in judgment. The striptease act may be the ultimate contest between audience and artist. The musical doesn't include the real thing, of course, but it hints at the strength it takes to command a stage. Director Jean Paterek and choreographer Sarah Venooker stage the songs to showcase the singer, not to reveal relationships between the characters. The lyrics are generally sung straight to the audience, and this style arguably suits a musical built on stage performance. Still, it's a missed opportunity. When Rose is rallying her troops, she doesn't pause to see if she's convincing them; she looks at us. Louise and the young dancer Tulsa (a fresh-faced Parker Nolan) have a duet that Louise should confuse with a flirtation, but Tulsa's eyes are always on the audience. Showcasing the cast's vocal strengths is smart, but we miss a sense of drama unfolding. This production emphasizes musical entertainment, not a contrast between onstage glamour and backstage tawdriness. The show tunes are the point, and Stowe's cast performs them brightly, backed by a five-piece band led by musical director Becky Millard. Pursuing a dream is the most stirring of character motivations, and Rose's story is told with little concern for what her flamethrower of aspiration leaves singed. When the kiddie-act song "Let Me Entertain You" becomes a stripper's theme, we get a hint of how much childhood Louise has missed, but this production emphasizes high spirits and big songs.